As many of you know, we are in the process of building our “dream home”… a log home, no less. So we’ve been out of town the past couple of days enjoying our first-ever Log Home Show! Anyway, the one that we went to was at Pancake World… I mean Pigeon Forge, TN. Been to Pigeon Forge before? Did you ever notice that there’s a pancake restaurant on nearly every corner? Sometimes… two… on the same corner! Here’s more about the Log Home Show in Pigeon Forge, Tennessee. And I knew that he had a fondness for a particular hotel chain, but I never knew he had a fondness for high-dollar hotel rooms just for the sake of being high-dollar hotel rooms, alone. For months, he’s been raving about Hampton Inn, because they have “the best beds in the world”… Cloud 9 beds! Check out this brief video describing the Hampton Inn Bed Experience. I, too, know what it’s like to have a favorite hotel. There for awhile, mine was Holiday Inn Express — for these reasons. More about unique features at different hotel chains. But since I rarely travel with Jim on business trips anymore, I had no idea that he had actually become such a hotel snob. The Grand Resort Hotel is “attached” to the largest convention center in Pigeon Forge (according to some conventioneer we spoke to). This may not be the best choice for “hotel snobs”. I’ll the the first to admit… it looks much nicer in pictures. And being part of “the largest convention center in Pigeon Forge”, you’d think it would be very nice… if not luxurious. Truth be told, it wasn’t until we got to the all-u-can-eat “Grand Breakfast Bar” the next morning, that I became sort of a hotel snob myself… Pure insane silliness, I tell you! I’ll save that story for another time. Thankfully, the Log Home Show itself was awesome! It was fairly small (by typical “home show” standards anyway), but since this one was solely devoted to the log home building process, there were just the right number of vendors that we wanted to see — like log home furniture builders & retailers (our home will be all log, so I’m hesitant to put too much log-looking stuff inside it though) and stairways & railings people (for our many porches & balconies). 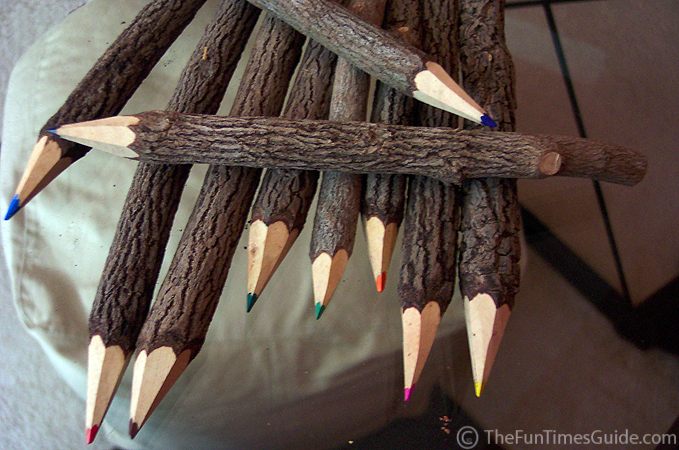 And check out these adorable log home pencils I found from an import furniture retailer! They’re made of real tree bark — actual twigs & sticks from the great outdoors. And some of them even have those “knotty” parts (ha!) which make them look more authentic. More about the fun stuff I found over at our Log Blog site …as soon as Jim gets back with the camera, that is.